We manufacture and supply various range of resuscitators which is an important piece of rescue equipment. To inflate the lungs of an unconscious person who is not breathing. We provide resuscitator for all age group of people like adult silicone resuscitator, infant silicon resuscitator and child silicon resuscitator.Ambu Bag is basically used for emergency respiration. 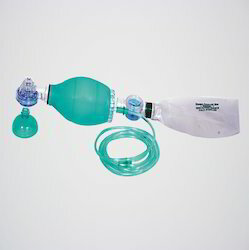 Artificial Manual Breathing Unit (AMBU) bag is useful for Emergency respiration. Generally Ambu Bag is useful for Medical Emergency, Ambulance Services, which requires quick respiration. Ambu is also know as Silicone Resuscitator Bag. Our Ambu bag is made by Medical Grade Silicone. Ambu bag comes with Bag, Reservoir Bag, Oxygen Tube, Mask. 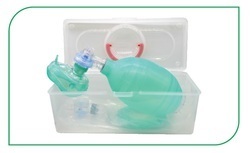 We are manufacturer of Silicone Resuscitator . It is made of very good quality silicone rubber available in colors like green, white, blue. Silicone artificial resuscitator is complete in pouch with face mask, oxygen tube, reservoir bag. Silicone Resuscitator Adult is with Face Mask Size 4 No. 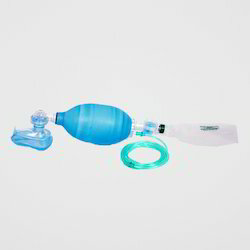 Silicone Resuscitator Infant is with Face Mask Size 0 No. Packaging Details: Pouch as well as Box Packing.